Welcome to nOma. Our goal is to fill the hearts (and bellies) of the Greensboro community with healthy, fast-casual Asian food. Created with family in mind we offer traditional Vietnamese and Thai dishes with locally sourced and supported ingredients. Passed down from our mothers, our heirloom recipes are packed with nostalgia, as they are meals you would find on families' dining tables all throughout Asia for breakfast, lunch, and dinner. Growing up in Vietnam, Kieuanh spent many hours at her mother's hip in the kitchen. Hence, nOma's dishes are crafted from generations of experience and are a beautiful marriage of Kieuanh's legacy. As a busy mother herself and a well-established business owner, Kieuanh knows the difficulties in balancing work and planning healthy family meals all too well. And so nOma needed to be more than just an eating establishment or a new business venture. While developing Noma's concept, Kieuanh conversed with several families of the Greensboro community and discovered healthy meals are usually only possible when "we can squeeze it into our schedules." As a solution, she centered nOma's menu to fit that need. Your favorite base and meat, accompanied with organic spring mix, sliced onion, fresh bean sprouts, cucumbers, pickled carrots and radishes, jalapeños, cilantro and a side of sweet chili garlic sauce. Simply mix and enjoy! Want more variety? Try one of these popular combinations. The most popular soup of Southeast Asia! 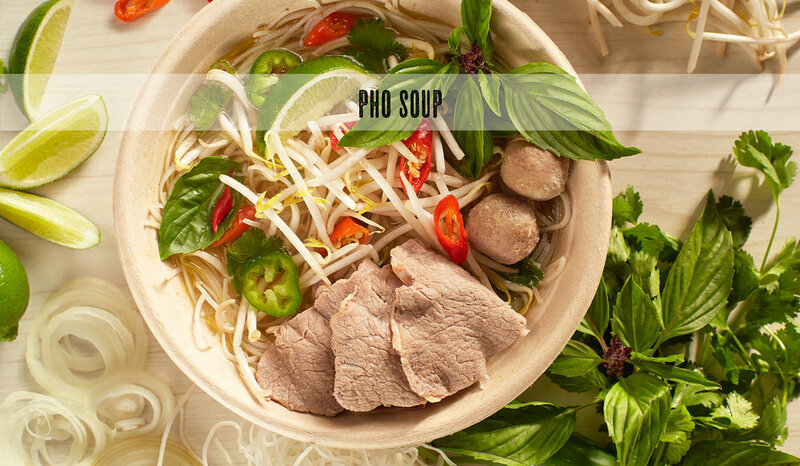 Poached rice noodles in homemade soup broth, topped with sliced onion, fresh bean sprouts, basil leaves, chopped scallions, cilantro, lime and your choice of meat topping. Originating from Central Thailand, this chili based curry is the most widely known Thai curry. Comes with a choice of noodle, brown rice, or white rice. The perfect handheld meal! (3) Fresh rice wrappers filled with lettuce, fresh bean sprouts, carrots, cucumbers, cilantro, basil, vermicelli and your choice of meat. (4) Fried Rolls made with pork, carrots, cabbage, noodles and scallions, wrapped in wheat paper served with lettuce, pickles, cilantro, basil and sweet chili sauce. (5) Fried Rolls made with vegetables, noodles and spices, wrapped in wheat paper served with lettuce, pickles, cilantro, basil and sweet chili sauce. Oven toasted baguette with homemade mayo spread stuffed with your choice of meat, cucumbers, pickled carrots and radishes, jalapeños, sliced onion, cilantro and sweet hoisin sauce. For kids 10 and under. All nOma Kids’ items served with one drink: a bottled water or organic juice. Comes with a choice of rice or noodle. Consuming raw or undercooked meats, poultry, seafood or eggs may increase your rick of foodbourne illness. We do our best to avoid but cannot guarantee that food allergens will not be transferred through accidental cross-contact. 1. Vegan/ Gluten Free options available upon request. 2. We do our best to avoid but cannot guarantee that food allergens will not be transferred through accidental cross-contact. A perfect combination of handmade fresh spring rolls with your choice of meat and crispy fried rolls. Vegan options available! Delicious grilled chicken skewers drizzled with homemade teriyaki sauce. Great addition to your salad or fried rice tray! Carrots, grape tomatoes, cucumbers, broccoli, cauliflower, bell peppers, celery, snow peas, and asparagus. Served with ranch or vegan dipping. 1/2 sandwiches of your choice of meat including chicken, pork, steak, vegan ribs or vegan tofu on a baguette or tortilla wrap. Jasmine white rice or brown rice stir-fried with peas, carrots, onion, and egg. Vegan option available! A variety of delicious seasonal fruits.